pinhole image (homemade "picassocam" camera) processed w/black and white chemicals in the darkroom, then Photoshopped beyond over yonder. While on the way to Lake Havasu City, I insisted that we stop in Quartzite (central-western Arizona, near the border of California) to visit Hi Jolly's monument. It was an innocent request; as I held the memory of my drive through Quartzite 20 years ago, when it was October, and the town was nearly vacant. A new picture of Quartzite thrust it's face into ours this time though- in the form of ((thousands)) of gem show-goers, winter visitors (the same bunch) and California drifters. On this day in January, Quartzite was a mecca of activity, out in the middle of the remote low desert! Rvs where parked and driving everywhere, and zipping between them were seniors driving golf carts and ATVs, and the drifters in their micro busses and vans. We had a little scary restroom incident, and then high-tailed it out of the gas station mini mart to make our pilgrimage to Hi Jolly. Fortunately, the Hi Jolly Cemetery was a quiet, sane, fascinating historic place to quiet our jittery nerves. We read headstones of folks who lived in the 1800s- the founding families of Quartzite. 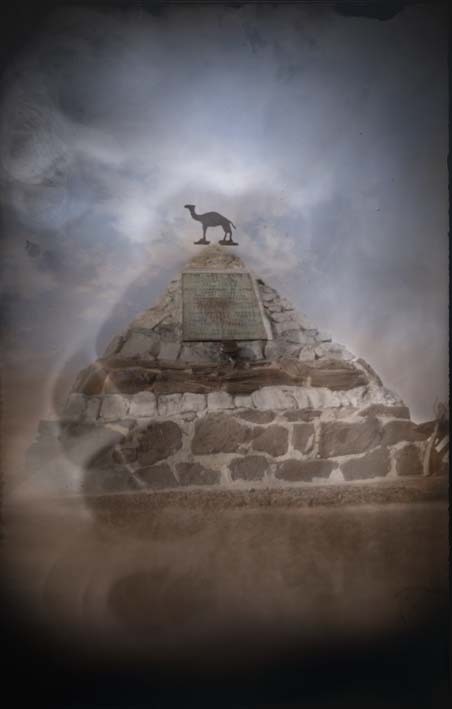 I made the pinhole image of Hi Jolly's monument above. So who is Hi Jolly? Hi Jolly was employed by the US Government in the mid 1800s for training imported camels for "freighting" and communication.. The government experimented with camels briefly in the arid climes of the expanding West, but gave it up in favor of using burros. The use of Hi Jolly's camels were considered successful by Lt Beale, who used them on his 1857 expedition across Arizona. It wasn't meant to be however, and the camels were left to fend for themselves near this location in Quartzite. It is reported that the camels survived for many years, and were the focus of excitement and curiosity. Hi Jolly was from Syria originally, and died in Quartzite in February, 1856. This memorial and grave site is also a time capsule. It is located right at the entrance of Hi Jolly Cemetery in Quartzite, Arizona. The monument was erected in 1935. It was well worth the trip through Quartzite. We learned some fascinating history, and I got to pinhole a pyramid in the middle of the desert, with a camel on top. How many days in one's life does a person get that kind of opportunity?